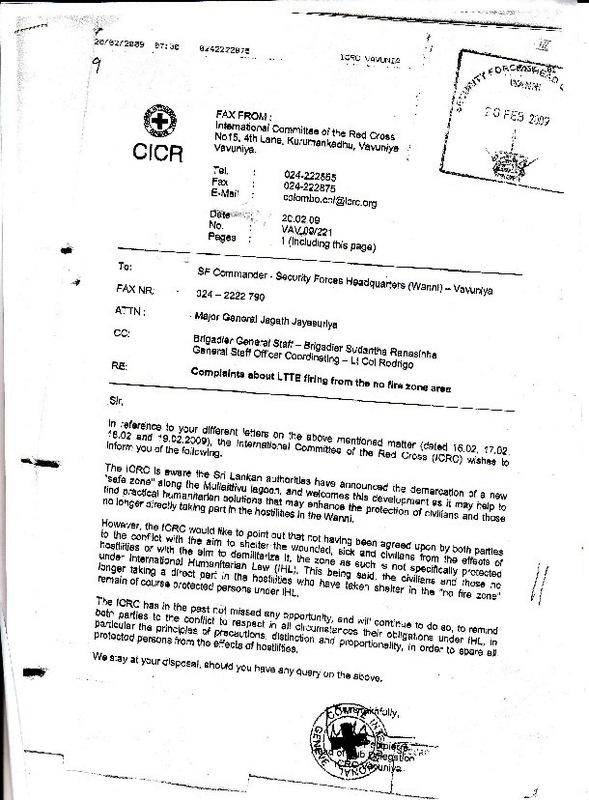 The Sri Lankan army was kind enough to give me copies of all communications it received from the ICRC during the first five months of 2009. It is possible that it omitted some, and there may have been other oral communications, but what I have tells a very different story from what Darusman and Weiss and Channel 4 present. I believe it would therefore help if the ICRC made public any other communications it might have made, and also the communications it made to the LTTE ‘to respect in all circumstances their obligations under IHL, in particular the principles of precautions, distinction and proportionality, in order to spare all protected persons from the effects of hostilities’. If the silence of the ICRC, though breached irresponsibly on occasion, can be explained by its obligations of confidentiality, there is no such excuse for the UN. They never declared openly that the LTTE was preventing its local staff from leaving the No Fire Zone, and even the one occasion on which they expressed awareness that the UN Communications Hub in Puthukkudiyirippu was being endanged, they used the passive voice to avoid attributing agency – It was reported to us that ‘artillery and mortar bases have been established in the general area of our communications hub from where they deliver fire to your forces’. Having acknowledged awareness of what was going on, Chris du Toit, who with his experience of working with the ghastly terrorist forces of Jonas Savimbi in Angola had been made Chief Security Adviser to the UN, then requested the Security Forces Commander to ‘inform your respective ground commanders and artillery commanders not to deliver any artillery, mortar or small arms fire into the general area of the hub’. 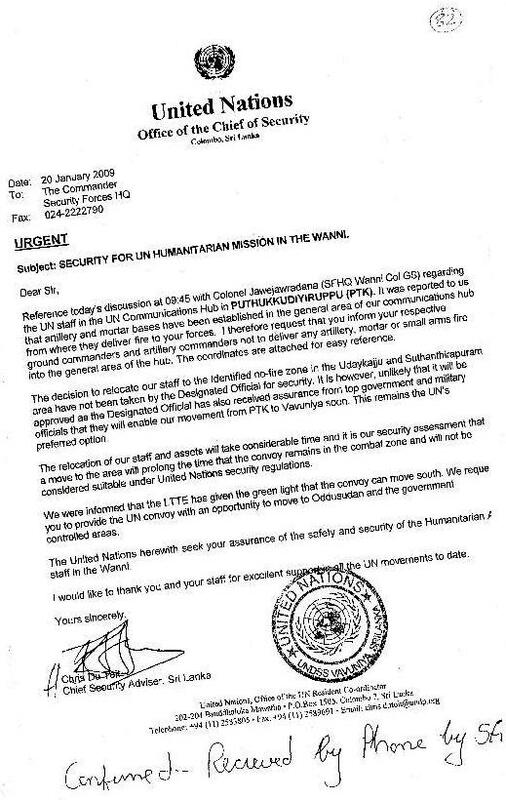 Letter from Chris Du Toit - UN Office of the Chief of Security, 20 January 2009. Whatever interpretation is given of the term ‘general area of the hub’, this is rich indeed. ‘They are firing at you from the general area of the hub, but you should not fire back,’ is essentially what Chris Du Toit is advising. Given the suspicious manner in which the so-called hub was set up, and continued to operate, which I shall look into elsewhere – in discussing the information purportedly supplied by Colonel Harun Khan, the head of the convoy in the hub at the time – one wonders indeed whether du Toit had not thought up a brilliant Savimbi type tactic to throw the Sri Lankan forces off their stride. Du Toit’s letter was sent on January 20th. That was when the first No Fire Zone had been declared, which encouraged the LTTE to continue with the tactic, perhaps heartened by the knowledge that, since they had not agreed to the NFZ, it was not protected by IHL. Needless to say, whatever they did seemed innocent to the Darusman panel, which engaged in its customary whitewash of the LTTE by declaring about incidents on January 24th – ‘Although LTTE cadre were present in the NFZ, there was no LTTE presence inside the United Nations hub. The LTTE did fire artillery from approximately 500 metres away as well as from further back in the NFZ, but the area where the United Nations was based was very clearly civilian’. The UN did not it seems ask the Tigers to take their weapons away from the NFZ. The Bishop of Jaffna was made of sterner stuff, and on January 25th, in a letter which thanked the government for declaring a ‘Safety Zone’ as he termed it, and asked that it be extended (which would surely not have been proposed had he thought the government was firing into the Zone), he noted that ‘We are also urgently requesting the Tamil Tigers not to station themselves among the people in the safety zone and fire their artillery shells and rockets at the Army’. That appeal failed. Meanwhile Chris du Toit, in discussing with Nishan Muthukrishna and me the shells that had fallen near the UN hub – and it should not be forgotten that no member of UN staff was injured during this whole period – noted that they could not say from where the shells had been fired. Of only one, did he note, could the direction be definitely stated, and that had come from the LTTE positions. But none of this was made public, and so the LTTE continued on its merry way, using the civilians as fodder, precisely as it had intended all along. Whether it was pusillanimity or practice that prevented the so-called international community from objecting at the time is not clear. But it is particularly rich that now, when all that is forgotten and those who abused the civilians are beyond criticism or justice, they all in their different ways throw at us the book they clutched sedulously to their chests while the people were suffering.